Tim West straight grain with plateau top. 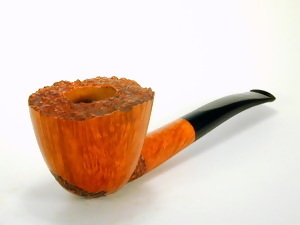 Quarter-bent with Lucite stem. Leather sleeve. L = 6.6 in. /17.3 cm. W = 2.1 in./ 5.3 cm. Weight = 2.5 oz. / 71 g.